If you are a Linux techie and fan of the RedHat ecosystem, you might have received word that the beta version of RHEL 8 is out. Years ago, I did a popular cover story for RHEL 7. It seems natural that I should continue the tradition and do the same with RHEL 8, even as it is still being polished. Chances are that by the time the final GA/production release is out, certain performance and versioning bits might be slightly different, so you are warned that this blog post will change, to reflect the expected changes. 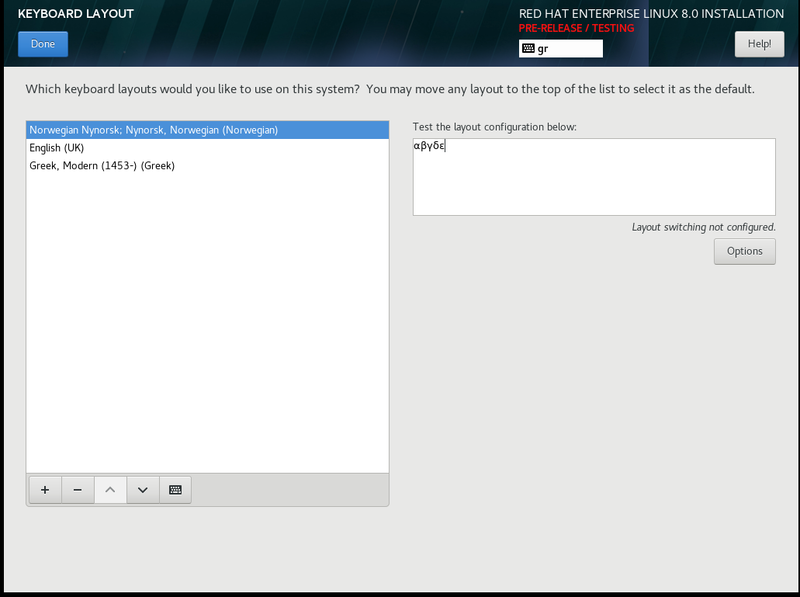 Let's start with a visual which is really the first thing you are going to see if you start the graphical target, which RedHat now calls the 'Workstation' environment group (more on that later, when I describe the installation bits). I bet it will look familiar to you (excluding the wallpaper) especially if you are a Fedora 28/29 user. Yes, it is GNOME 3.28, in particular version 3.28.2, the same as Fedora 28. 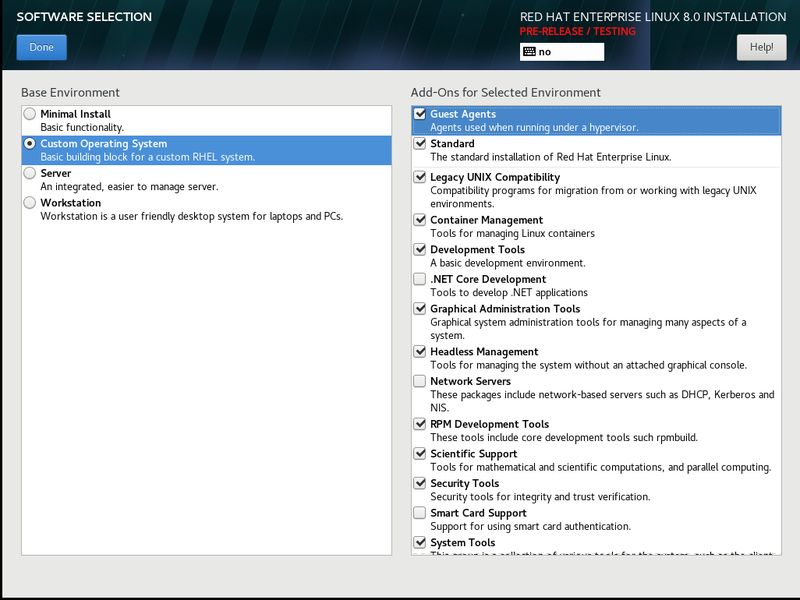 No surprises there as the Fedora project is used as the testbed for things that will eventually end up in the RHEL release. Wayland is at play by default here, although breath easily, as you can keep X.Org with your binary NVIDIA drivers and your multi-GPU setup (that will not work with Wayland, this is not a RHEL 8 thing). 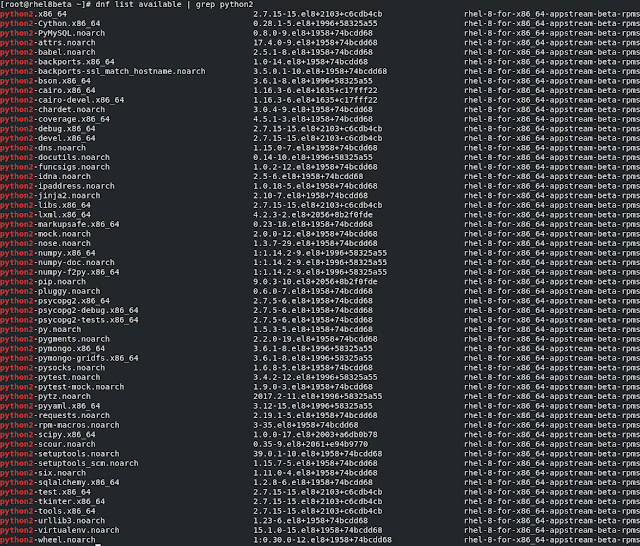 the Linux 4.18 kernel, 4.18.0-32.el8 in particular. This is a big and welcome step considering that RHEL 7 is based around the 3.10 kernel, which is really outdated in many respects (the latest at the time of writing was3.10.0-957.1.3.el7). As I write this, both active Fedora versions (28 and 29) have moved to the 4.19 kernel, but it seems that RHEL 8 has touch base with the 4.18 version and is likely to remain with that kernel. System stability and a more conservative environment when it comes to the backporting features and fixes (such as the Spectre and Meltdown patches that have substantial negative performance impact on the 4.20 kernel). 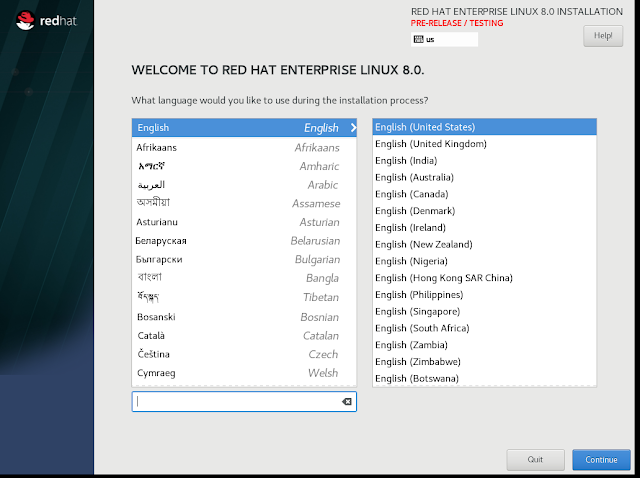 The default gcc version is now 8.2.1 20180905, in line with the active Fedora distros. 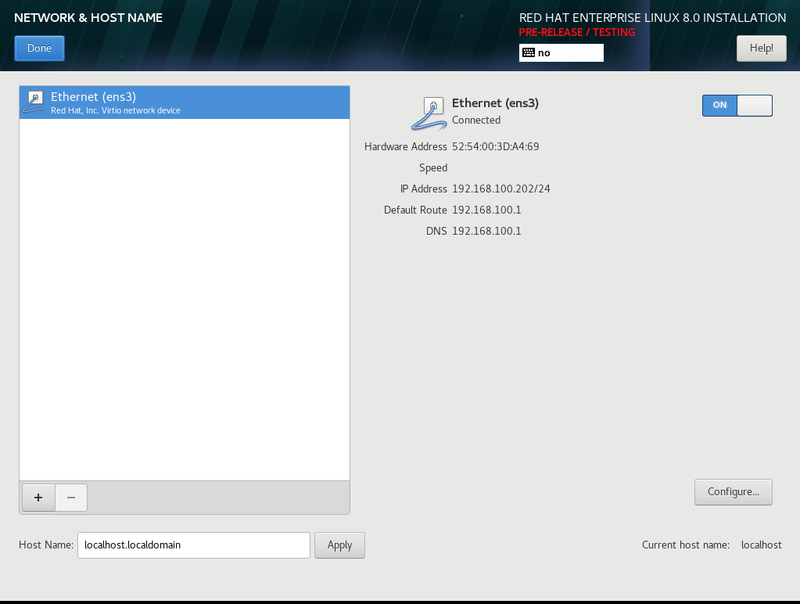 Compare that to RHEL 7's 4.8.5 20150623 also showing its date. 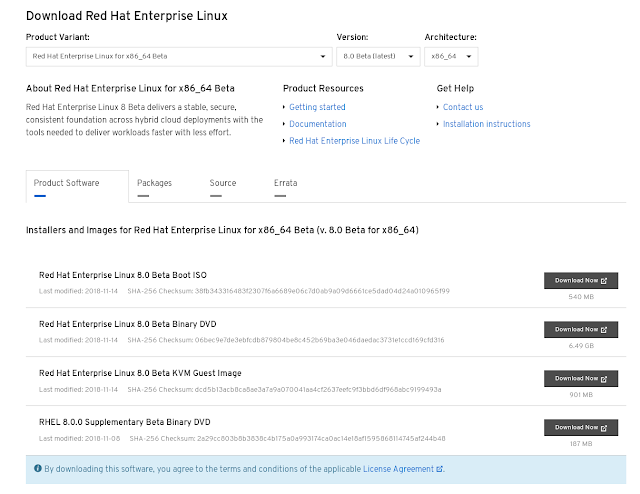 Just so that I am not misunderstood, if you run RHEL 7, you could install more modern compilers by using the Redhat's software collection repos (rhel-server-rhscl-7-rpms, the devtoolset-6* and devtoolset-7* yum packages). I emphasize the word *default* here, which means what comes with the basic installation and the simplest of entitlements. 4.8.5 is really out of date, it would make sense if Redhat makes an effort to set the default one to 4.9.4 for RHEL 7. Pythonistas should feel right at home, but they should note that only Python3 is installed by default, version 3.6.6 in particular. Python developers need to explicitly install the available python2 packages. Python 2.7.15-15 is there, but with limited support. Again, that's not Redhat's decision as Python 2 is reaching EOL by the end of 2019. The sooner you migrate your apps to Python3 the better, with or without RHEL 8. Perl fans should find a system wide version of 5.26.2 on RHEL 8. In comparison, RHEL 7 has Perl version 5.16.3. IMHO, if you run something production grade with Perl, you should at least be on 5.24.x these days to get the best performance and functionality. What you used to do with yum can now be done with dnf. That should not be news to you, especially if you have been following the Fedora releases. The introduction of the dnf tool has to do with important changes in the way software packages are tagged, installed and used (keep reading). The BaseOS repo: This includes RPM based packages for the core functionality of the operating system that can be searched, installed/deployed with dnf in pretty much the same way one used to do it with yum in RHEL 7. The Appstream repo: This includes utilities to run real world workloads (for example databases, web servers, runtime environments) that can be organized either as RPM packages (like in the BaseOS repo) OR as multi-versioned collections (called streams) organized in modules. Modules are RPM extensions and their streams should allow you to choose among different versions of the package. The concept of Application Streaming should give you the ability to have a module (say X) that offers you the Y and Z versions (streams) of a webserver. If Y is the production and Z the development version of that webserver, the Appstream repo should give you the ability to install X:Y on production systems and X:Z on your development cluster, all from one repo with a single command. You cannot install both versions in parallel on a system (unless you run your webservers in containers), but you should be able to install and run a specific version at a time. If you are thinking that someone is trying to re-invent the wheel, you are probably right. You could previously achieve the same functionality on RHEL 7 and other platforms with the Software Collections and you could also deploy things like Environment Modules to achieve the same result, albeit at a slightly higher complexity. 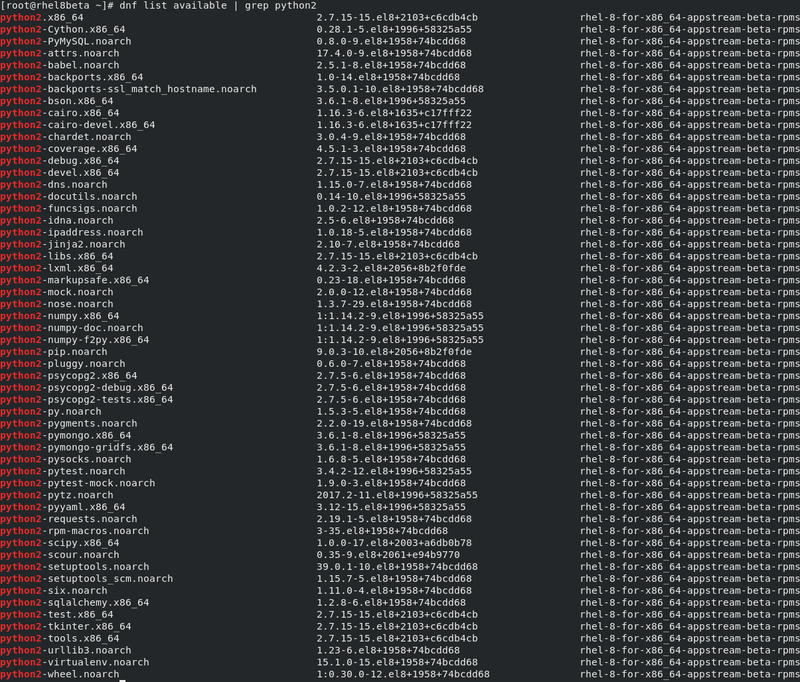 The idea is to perform everything here from specific repos and via your package manager. Software collections require more repos and they modify your Shell environment in ways that can create complex issues. Well, I am not trying to convince you to use one or the other here. You will be the judge of what works best for you. There will be an additional article exploring the issue of Application Streaming. 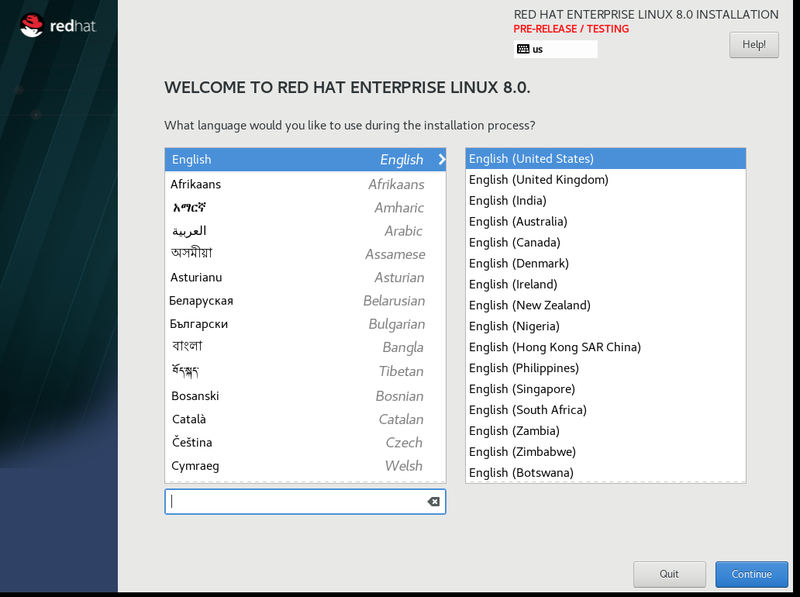 For now, this article will conclude with an overview of the RHEL 8 installation. I am going to outline the steps of installing a Virtual Machine hosted guest instance. My host operating system is Fedora 28 with its stock KVM/QEMU components. I dedicated 4 vCPUs, 4 Gigs of RAM, a functioning NAT enabled virtual NIC (to ensure that I can reach Redhat's subscription management infrastructure) and about 20 Gigs of a VirtIO disk for my qcow2 image. 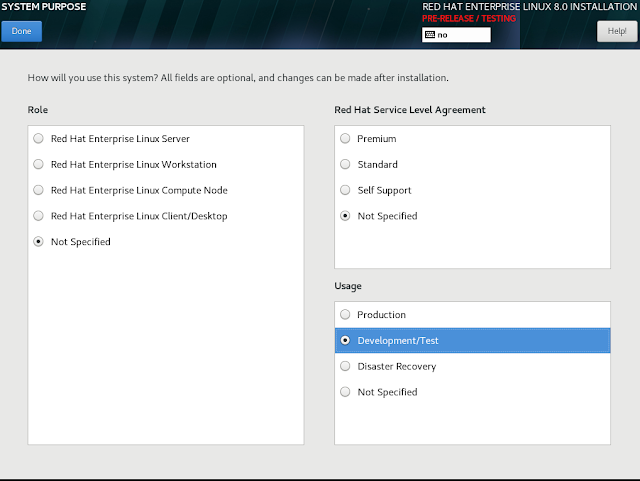 There are many ways to install a RHEL 8 instance and should start with Redhat's Customer portal. The one I describe here is the Anaconda graphical installer from the Binart DVD images. You will need an account and an active subscription (that you can obtain by request if you have a portal account). 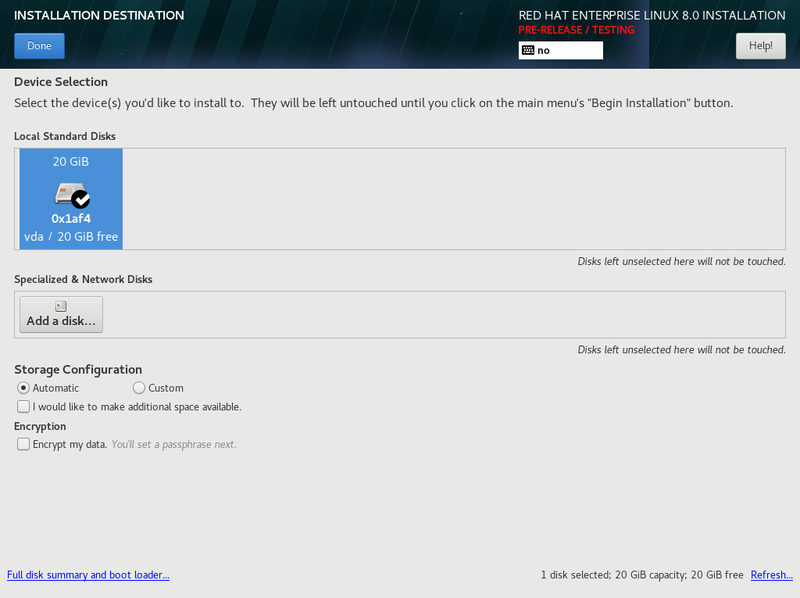 This will enable you to download the beta test distro in a number of ways, as shown below. I chose to download the 8.0 Beta Binary DVD, although the KVM Guest Image would have worked equally well (I wanted a complete set on a DVD image). After verifying the SHA-256 checksum, I immediately proceeded to install my guest image and was greeted by the first installation screen, choosing the installation language. 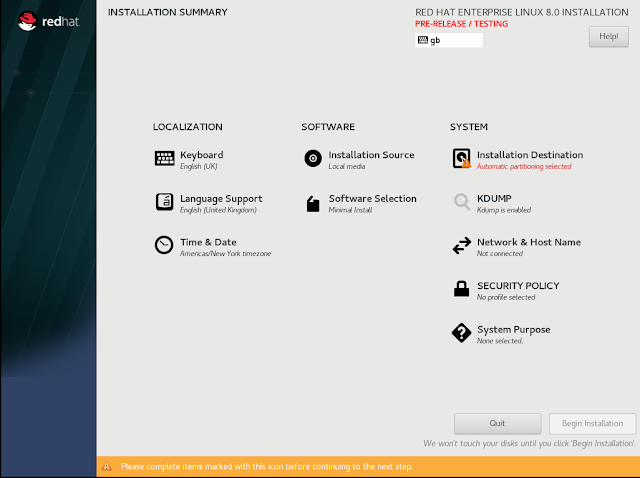 The main 'installation summary' screen feels very familiar to those of you that have recently installed a Fedora distro, although a couple options ('SECURITY POLICY' and 'System Purpose') seem new. The next step was to chose and test my keyboard layouts. I chose a Nordic (Norwegian), English and Greek keyboards and they seem to work OK. I *would* suggest that you choose to set your 'Time & Date' settings next, but this is not a good idea. 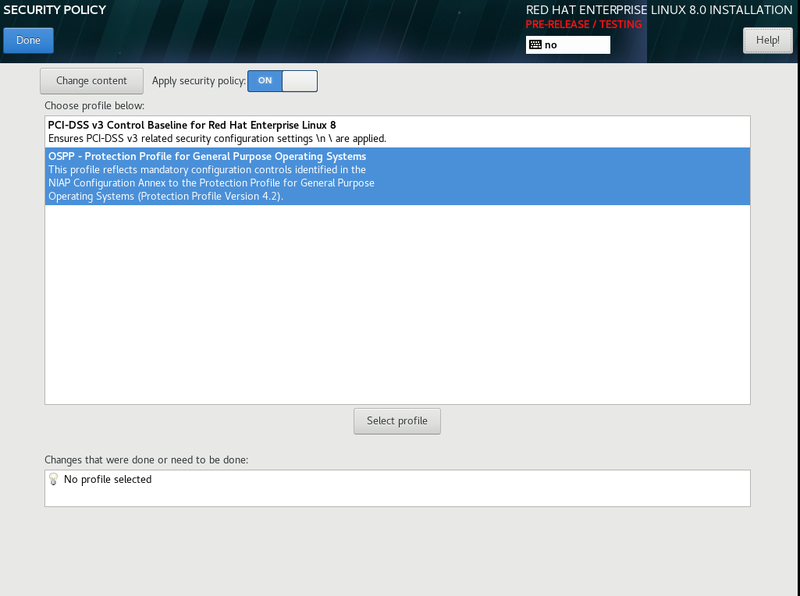 This is additional feedback I would like to pass on the Redhat team. You see, if you go to the 'Time & Date' settings, you choose your time zone and attempt to turn on the Network Time Protocol (NTP) by clicking on the ON/OFF 'Network Time' button, the button will refuse to stay on the 'ON' state. The seasoned sysadmin/developer might figure out that this is due to the fact that the NTP server was not reachable: Although I had a perfectly ready virtual NIC standing by, this was not enabled by default. The correct order is thus to jump first to the 'Network & Host Name' settings, enable the NIC and ensure you are online. 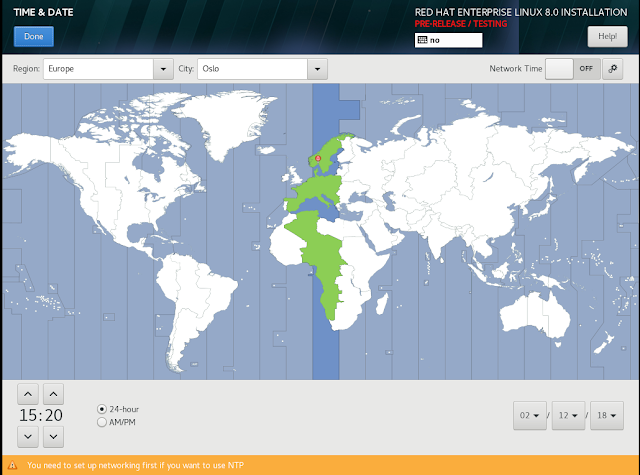 I can now navigate back to the 'Time & Date' settings and verify that NTP is on ('Network Time' button is set to 'ON'). Timing is important. I feel that turning the configured NIC on by default OR alternatively displaying some kind of error message (like 'Cannot turn Network Time on because your NIC is inactive')when the NIC is turned off would result in a smoother user experience for an Enterprise Operating System. Moving on to the next item of interest, the 'Software Selection' settings allow you to customize what will be installed (you can always modify this post installation). The distinction between 'Server' and 'Workstation' on the Base Environment is not new. If you want something customized to combine aspects of both, your mileage may vary. 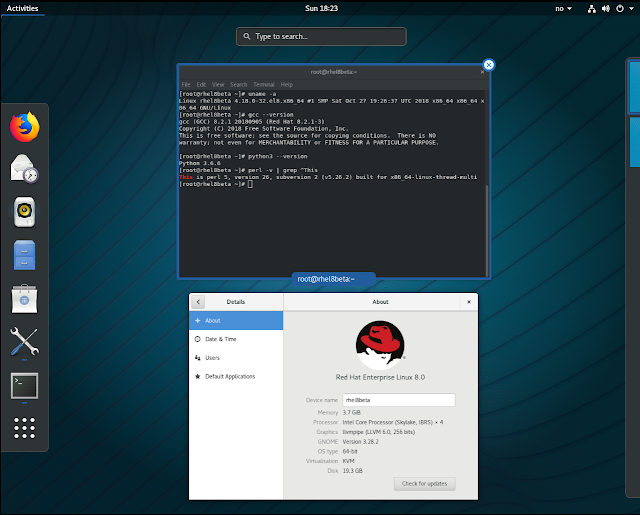 I would choose either 'Server' if you do not want a graphical environment or the 'Workstation' option (this was my choice for the demo I describe here) for a GNOME graphical environment. As explained, you can always add/remove stuff after the initial installation. The 'Installation Destination' setting offers no surprise. Here, you can choose your installation drive and possibly encrypt your partitions. Nothing new here. 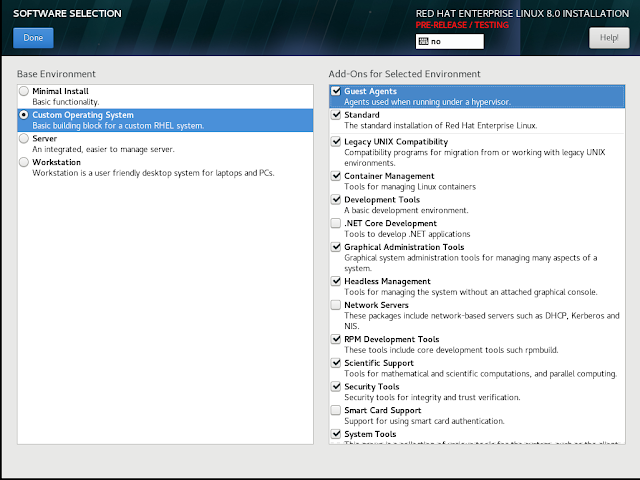 What's new in RHEL 8 are the following couple of screen settings. In particular, the 'SECURITY POLICY' setting, one can choose to customize the system between two policies. These policies ensure that certain components that have to do with firewalls, audit data and other OS settings are configured in a way that adheres to strict standard rules, to maximize your security. You should always check with your resident Information Security Officer, but as a rule of thumb, if you run the system in a bank or your system is involved in processing Credit Card data, the PCI-DSS v3 Baseline policy is a good one to choose. Alternatively, you can select the OSPP protection profile for general purpose OSes. Finally, the 'System Purpose' screen lets you categorize the Role, SLA and usage of the system. 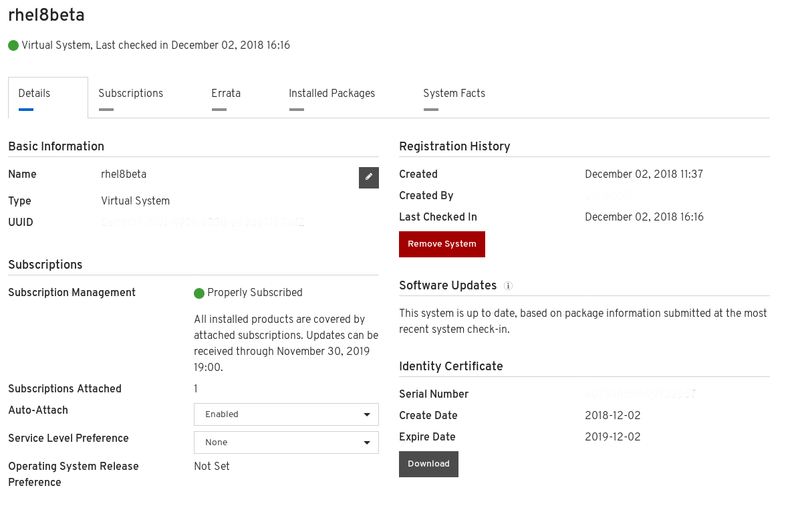 I am not clear as to how Redhat will uses these settings as part of their Support and system inventory processes, suffice to say that collecting these data can help them dedicate their resources more efficiently in a support case. Hit the 'Begin Installation' button of the installation summary screen and while the installer is progressing, you can set the root account password and an account. Eventually, when you reboot, you should be able to see the login screen of the graphical target. That's it, the system is now ready for use. Stay tuned for more RHEL 8 tests and analysis! As of the 26th of January 2015, Greece has elected a new Government, which seems to strike a cord with the very heart of the European administration. Many were quick to point out that the new Greek Government is an anti-European one and came into power due to the fact that Greeks voted with a sentiment of anger. This may be true for a good portion of its voters, who felt betrayed by the two older traditional political parties (New Democracy and PASOK). However, there is a certain truth behind the reason Greek voters selected SYRIZA and that has nothing to do with sentiments against Europe. It has to do simply with the fact that Europe has mistreated Greece and many Greek people felt abandoned, been unable to make a living and look after their families. As the Greek Government vows to re-negotiate the Greek debt on a European basis inside Europe, many key European politicians dismiss this need and refuse to listen to the Greek case, despite a wider European sentiment against the European policies that dictate austerity. In this article, I will prove why the reaction of the European administration is the wrong one. I shall present numbers that show why the Greek debt is not the problem of Europe. Europe faces an existential crisis and is currently unable to convince its member states about the sustainability of the collective European debt. Greece has of course been a problematic country, with systemic corruption and tax evasion. However, the worsening of the financial indicators in Greece and other problematic Eurozone members has very little to do with these factors and can be attributed more to the application of widespread austerity practices. These practices deprive the European South of vital abilities to restructure and develop their economies. This situation is not sustainable and its solution is not related on whether Greece remains or exits the Eurozone. For the record, I claim no political affiliation or financial interest in the way I express my opinions. 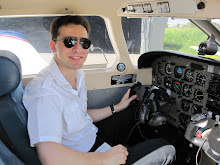 I would like to remain objective, and I welcome your comments. The Greek debt is best understood in comparison to other 'problematic' European countries. Throughout the article, I use the term 'problematic' to refer to Eurozone member states that have seen substantial worsening of their financial indicators. This worsening is of course due to the over application of austerity policies, which had the completely opposite effect than the intended one. I used the Google public data platform to fetch relevant data from Eurostat and the World Bank, in order to increase the verification of these results. Graph 1 shows clearly that Greece has the highest Government debt as percent of GDP. However, Graph 1 also indicates two easily verifiable facts. The first fact is that the problem is worsening not only for Greece, but for all other countries since the beginning of the Eurocrisis (starting from 2008). Despite the austerity measures suggested by the Troika 'experts', Spain, Italy and Portugal see their GDP debt ratios increase consistently and substantially, a sign of their worsening economies. In addition, other members of the Eurozone that are not displayed in Graph 1, have also seen notable increases of the debt/GDP ratio. A few notable examples include Ireland whose ratio jumped from 44.2% in 2008 to 124.2% in 2013 and Belgium that went from 89.2% (2008) to 102.4% in 2013. All of these countries have seen austerity measures decided by the Troika or various national governments imposing a policy dictated by Brussels. For Greece in particular, one should note two key dates. The year 2001, when Greece started using the Euro and the year 2008, when Greece started entering the spiral of the financial crisis. Systemic corruption and tax evasion in Greece were present before these dates. However, the severe worsening of the financial indicators occurred after the year 2008 and spiraled out of control after the application of the Troika policies. A classic example of the application of too much medicine on a patient that needed it, but not in that quantity. What did the austerity measures do for the national economies of these countries? To answer this question, we have to come to the second fact that reveals the complete picture of what happened to Greece and to some extent the rest of the problematic European economies. Graph 1 displays a clear economic deterioration, but what exactly has caused that deterioration. There are a lot of opinions about the South of Europe tied to stereotypes of lazy people, corrupt politicians. I dismiss these theories, because lazy people exist all over the world. Corruption is systemic in many South European countries. However, corruption itself is not enough to cause this type of economic deterioration. The answer lies in what happened to the GDP of these countries for the same period of time, as displayed in Graph 2 below. Graph 2 shows the notable GDP reduction in various Eurozone countries. There is an important detail that is not easily shown in Graph 2. Starting in 2008, the Greek GDP went from 350 Billion Euros to 242 Billion Euros in 2013. In five years, 30% of the GDP disappeared from the pockets of the Greek citizens. We have rarely seen such a rapid GDP reduction in the global financial history, which displays clearly the weight Greek citizens had to lift on their shoulders, as a result of the austerity. In comparison, Ireland, Portugal, Spain and Italy lost approximately 8%, 10%, 10.4% and 5% of their GDP respectively, during the same period of time. The ostricism of the Troika and Brussels has to do with the fact that everybody is talking about Greece, like it is the largest problem of Europe. I am afraid this is a very flawed attitude. Brussels (and Germany in particular) hide their head in the sand and avoid to see the wider picture, which consists of the the actual number of Euros owed by each one of these countries. The next graph indicates the actual amount of Euros owed by each of the problem countries, because not everyone can actually appreciate the effect of the GDP debt ratio in a common currency (unless of course you are an economist). Graph 3 shows clearly that Greece is not really the factor that could derail the Eurozone train. Italy and Spain owe collectively more than 3 Trillion Euros, a staggering amount of money that cannot be absorbed by any corrective measures. These 3 Trillion Euros exclude the extra 2 Trillion Euros of France, a large part of the European economy that is also start becoming problematic. Let's assume that Europe does not find an agreement with the SYRIZA government and develops the legal/procedural framework to oust Greece from the EU, in order to demonstrate what happens to the bad boys that do not keep their promises. It is true that Europe can today catch the 250 billion Euro bullet owed by Greece. However, Europe will be fooling itself. Because although it may absorb the shock waves of the comparatively small Greek debt, it will not be able to absorb the trillions of Euros owed by the rest of the stagnant national economies of the Eurozone. The reasons are simple and evident. First of all, despite a buffer of 1.1 Trillion Euros that the ECB can dedicate to kickstart the economies, Europe does not have policies, mechanisms and a clear plan to make that kind of money work, because the North and South are divided in theory, practice and culture. 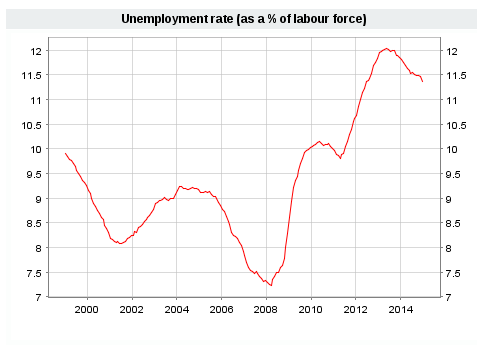 For more than seven years now, Eurozone officials have failed to tackle vital issues such as the unemployment issue (Graph 4), more evident in the European South. The lack of developmental capital and vision to help the South retain young people in Greece, Spain, Italy and Portugal has led to massive migration of the productive workforce to Germany, the UK, the Scandinavia and even outside the European continent. How these countries can build a tax base to fund functioning states is a good question. As far as I know, nobody has built successful tax systems out of pensioners, students and people who have partial or no employment at all. As the elections in Spain are nearing and the size of the Spanish debt is much higher than the Greek one, I am sure that these data can convince even the greatest hardliners in Europe to listen to the Greek case. 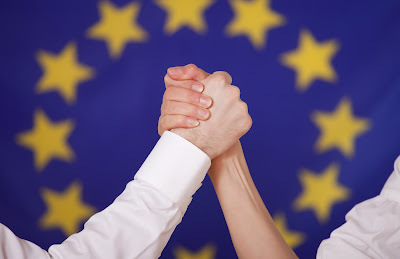 I am certain that the voice of reasoning in Europe will win. Greece, even battered, will eventually exist with or without the Euro (my preference is within the Euro). I am not sure that the Euro will exist without a change of policy. Greek citizens have already lost a lot (some have nothing to loose any more) and Europe should listen very carefully this time.